I've had this post in 'draft' with just a title for nearly a month now. I think I saw a good story and thought I'd write it up then something happened (I was probably taken ill and had a couple of those 'couldn't bear to even turn on the laptop' days!). So what was it about the Davies brothers that interested me? John Edward Davies is one of the men who was named on St John's Church war memorial plaque, now sadly lost after the church was demolished in the 1960s. I have been researching the 140 names listed in a newspaper cutting from the Barnsley Chronicle reporting the dedication of the plaque in 1921 - you can see a copy of the cutting on the webpage linked above. 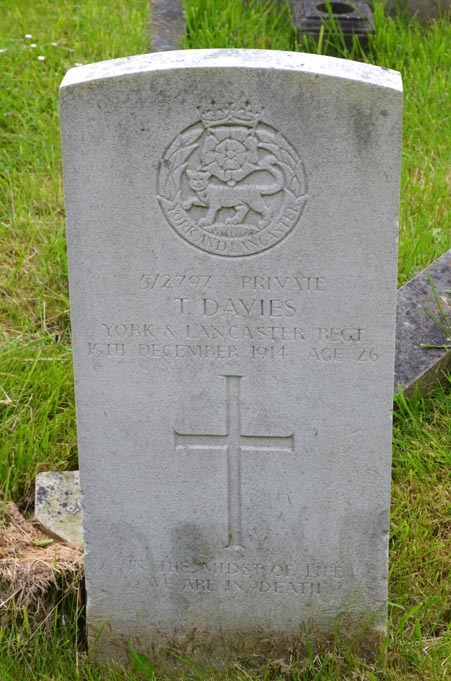 According to his Commonwealth War Graves Commission entry John Edward Davies was in the 2nd Barnsley Pals, the 14th battalion York and Lancaster Regiment, and had died on 9 April 1917 and is buried in Chocques Military Cemetery in France. No family information is given on the entry so I had to search a bit more to find out who he actually was. The extra documents you now get at the bottom of the page gave me a name and address, although no inscription had been requested for John's CWGC gravestone. So who was she? His widow remarried? His married sister? His mother under another married name? His obituary in the Barnsley Chronicle (available to search digitally at Barnsley Archives) confirmed 64 Copper Street as his home address, but stated that he was a widower with one child. So not his wife then ... I additionally learnt that he had joined up in January 1915, which fits nicely with the known timeline for recruitment to the 2nd Barnsley Pals. He had previously worked at Barrow Colliery and had been 27 years old when he was killed in action - making him born around 1890. A death notice in the same issue of the Barnsley Chronicle was from "his daughter and mother-in-law" so maybe Mrs P Allenby was his deceased wife's mother, who was caring for his little girl for him? However I could not find a marriage in Barnsley for Davies and Allenby on FreeBMD even with imaginative use of wild cards in the two surnames. A second death notice was from "his loving brother and sister, James and Gertrude". I noted this just in case it was a vital clue! During searches of the census on Ancestry I discovered that Allenby was actually Allemby - there is no-one in Barnsley by the former name during the period covered. Eventually, in the 1911 census, I found a Mrs Phoebe Allemby living at 31 Brittania Street which is very near Copper Street. 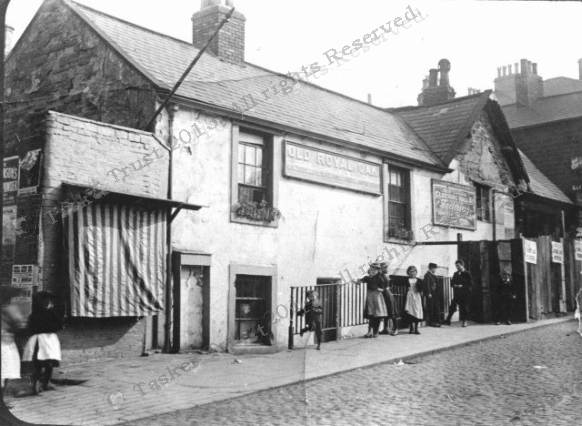 Neither of these streets still exist - they were in the vicinity of Joseph Locke House off Sheffield Road in Barnsley - although there are a Copper and Britannia Close nearby. No sign of a daughter, married or otherwise, although Phoebe does declare that she has been married for twenty-one years, having six out of seven children still living and yet there were only three sons at home, the youngest being Joseph Wilkinson Allemby aged just 3 years old. All the family listed were born in Barnsley. I also found an Ann Allemby, aged 19, born in Barnsley, in service at a farm in Flockton, near Wakefield. Nipping back 10 years to the 1901 census I found Phoebe, together with husband Arthur and four children, including Ann aged 8, living in the Old Royal Oak, Peel Square! I do like a pub connection! Arthur Allemby is listed as the Innkeeper, working on his own account. He was born in Clayton West, but the rest of the family were from Barnsley. He must have been away from home on census night 1911. The idea of Ann living away from home as a servant suggested I widen my search for an Allemby Davies marriage. It turned up in Sheffield in the September quarter of 1911. Ann Allemby married John E Davies. Good - that's sorted then. As John was a widower by the time of his death I looked for Ann's burial in Barnsley cemetery. Sure enough, Ann Davies aged 22 (oh, dear) was buried in March 1915 from 58 Britannia Street. So this was after John joined up, but while the Pals were still in training in Barnsley, how sad for him. In the same grave plot was Lily Wilkinson Davies aged 3, of 66 Copper Street, who died in December 1915 aged 3 years. Could this be his daughter? But his daughter was alive when the death notice was posted - so Ann and John must have had at least two daughters. Just to confirm matters Phobe Locke Allemby aged 77 is buried in the same plot in 1944 from 5 Dobie Street. The family seem to move around a fair amount, maybe from one rented property to another depending on needs and income. Oddly there was no sign of husband Arthur Allemby in Barnsley Cemetery and a general search on FreeBMD did not turn up any likely candidates. A chap dying in Hyde in Cheshire in 1942 was the closest match. I wonder what happened to him? So the Mrs P Allenby mentioned in John's CWGC record was his mother in law. Why was she his next of kin - and who were James and Gertrude? Not Allembys, neither name appears in Phoebe and Arthur's family. So Davies then ... I had not yet identified any census returns showing John Edward Davies - I had a couple of possibilities but nothing certain. Maybe James and Gertrude were going to be a clue after all. After finding a James Davies (b.1883 in Barnsley) married to a Gertrude living in Wombwell in 1911 with their three children I tracked them back and discovered that William and Ellen Davies of Shaw Street, Barnsley (see above) had sons James and John who were the correct ages to fit the other known facts. I went forward to the same family in 1911 - lo and behold - John is now listed as John Ed confirming that I've found the right family. Thank you James and Gertrude! The Davis family are now living at 46 Grafton Street (I had to look that one up on Google maps!) which is off Racecommon Road and not very far from Shaw Street. Nice little terraced houses with new doors and windows not long before the Google camera went around from the looks of it. William and Ellen had not been very lucky with their children - on this census return they declare they have had ten children and that six of them have already died. They have two adult male boarders living in, probably for some extra income - but that must have made the house very crowded, it only had five rooms. As John Edward's brothers, James, Harry and Thomas were in the right age range for conscription in the First World War I tried looking them up on the Absent Voters' List for 1918 (full alphabetically sorted transcription now available in Barnsley Archives) but there was no sign of them. Of course if James had remained in Wombwell he would not have been on this list as it only covers the central wards and the neighbouring townships. Next I tried Barnsley Cemetery to see if I could find poor William and Ellen's lost six children. Ellen dies in April 1914 aged 58 at 46 Grafton Street and William joins her in the same plot in December the following year. Ah, ha! That is why John Edward's parents are not his next of kin - they had both predeceased him. There are no other Davies burials from Grafton Street and none from Shaw Street, but there are two from 7 Longcar Street, which was William and Ellen's address in 1891. One is a child, Esther, aged 16 months, who could be one of their lost children. The other is a 26 year old, Ernest Davies - maybe William's brother? However I did spot the burial of a Thomas Davies the right age to be John Edward's brother in a CWGC grave. Place of death ... drowned in the canal! We have a good collection of photos from Barnsley Cemetery now, thanks to the Barnsley War Memorial's Project's Information Officer Pete Schofield, so I was quickly able to find the image on the left. This confirmed what I'd seen in the burial transcription - Thomas died in December 1914, very, very early on in the war - and obviously at home as he was buried in our local cemetery. A search of the Barnsley Chronicle gave me the answer. 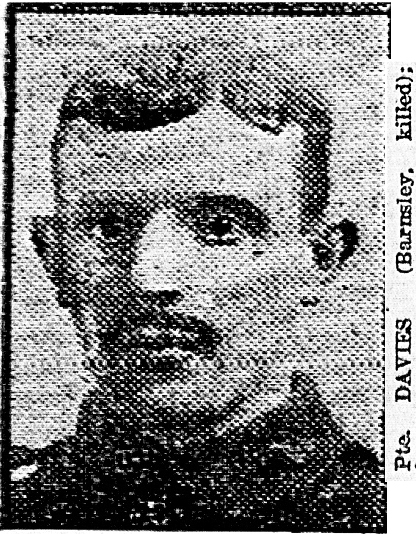 On 19 December 1914 it was reported that Thomas Davies, a colliery trammer, who had enlisted in the 5th battalion of the York and Lancaster regiment disappeared the day after his enlistment. His body was found four weeks later in a badly decomposed state floating near Craik's bleach works (this is at Old Mill). He was identified by a knife and fork found on him which his wife, Mrs Annie Davies, said he had taken with him when he went to report to the Drill Hall after his enlistment. She also noted that he had been in ill health for some time and another witness, Robert Atherton, brother-in-law of the deceased, said that he had noticed Thomas getting very depressed recently. The coroner's verdict was that he had, "Drowned himself whilst of unsound mind through illness and being unable to do the duties as a soldier which he had undertaken." The connection between this man and John Edward Davies was proved when I found Thomas' marriage certificate on Ancestry. Note that address of bride and groom is 46 Grafton Street - William and Ellen's address in 1911. The bride is called Annie - the name given in the newspaper cutting and her maiden name is Hobson. The witnesses are John Edward Davies and his wife Ann Davies. In 1905 Robert Atherton - mentioned in the newspaper report as Thomas' brother-in-law - had married Annie's sister Elizabeth Hobson at St John's Church in Barnsley. So there we have it - two brothers, both remembered on the Commonwealth War Graves Commission website, but who lost their lives in such completely different ways in the First World War. Thomas enlisted first in November 1914, but due to ill health and other pressures upon him felt he just couldn't cope with being in the army and ended his life in Barnsley canal - I think it was good of the military authorities to recognise that his death was in service and possibly exacerbated by worries about training and combat and permit him to have a CWGC commemoration. However he is not remembered on any war memorial in the Barnsley area that we are aware of. The following January his younger brother John enlists and was wounded in June 1916, not long after arriving in France with the Barnsley Pals. He misses the first day of the battle of the Somme but returns to France in January 1917 only to be be killed in action in April. John Edward Davies was remembered on the St John's church memorial - now sadly lost. One last thing - a search for Arthur Allemby on the web did not solve the problem of where he vanished to after fathering Joseph Wilkinson Allemby, Phoebe's youngest son, in mid 1906, but it did return a possible solution to the missing daughter of John Edward Davies. Phoebe Locke Allemby (nee Wilkinson) left a will and it is catalogued on The National Archives website as being held by Barnsley Archives (A/1882/B/1/193). Among the beneficiaries are Harry Allemby, presumably Ann's brother, and a Laura Davis - surely the missing daughter despite the slightly different spelling? So next time I'm in the Archives I'll be calling that up from the store! Thanks for reading - I hope you enjoyed that puzzle as much as I did! John Edward Davies was my great grandfather . Laura Davis was my grandmother.